Each ‘Duet’ instrument is an exquisitely made double ocarina, with two 4-hole chambers in a single outer body. Covering different holes on the left and right chambers simultaneously gives sparkling harmonies. Cover the same holes on both to play in rich unison. Then play a melody on one side with drone bass on the other to explore a more ethnic ‘bagpipe-style’ sound. The Duet Ocarina is a great audience-pleaser. Born out of attempts to play two one-handed ocarinas at the same time, each Duet Ocarina is equally balanced on both sides to play in unison or two-part harmony. Eleven notes with each chamber offer a large number of different combinations and harmonies to explore. 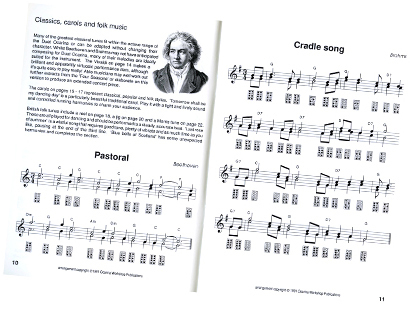 The Duet Ocarina Book has music to challenge the skills of any musician. With the help of special Duet finger-charts under the notes, you’ll be delighted to be able to play straight away. Amaze your friends with your solo harmony performances! Browse OcShop to choose your Duet. As with any musical instrument, the size of the ocarina determines its sound. Listen to the sound files on this site to hear the deeply mellow Bass Duet, the high soaring Soprano Duet, the rich Tenor Duet and our favourite of all, the Alto Duet, which is easy to hold and encapsulates all that is best in Duet Ocarinas. These are unique instruments that open up a whole new world of harmony to the solo ocarina performer. As you listen, remember that just one person is playing on a single instrument. These beautiful instruments are easy to play and both pleasing and challenging to play well! 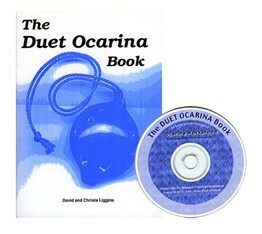 The unique Duet Ocarina Book and CD will support you every step of the way.